A decent mystery movie about uncovering and deciphering clues. What we have here is an okay conspiracy, coverup, and follow the clues movie. Call it the National Treasure of the religious world. This movie is dark and ominous, and thankfully it stars Tom Hanks, an actor who is always fun. But the story isn’t anything special and the clues are just okay. A much better film in this series, with Hanks playing the same role, is Angels and Demons. That’s the movie where this series hit its stride. With the Da Vinvi Code, it’s really just trying to figure things out. 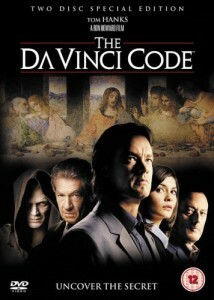 As far as conspiracy and riddle movies go, the Da Vinci Code is not bad. It’s one of those films based on a Dan Brown book about his character Robert Langdon, a symbologyst who gets called in to help uncover the truth. Angels and Demons is the better book and movie in the series, and it’s also meant to be the predecessor to this film, but the movies switch that around, (making Angels and Demons the sequel,) and it works out pretty well. After all, Langdon is only called in for that case because he’s the man who has a reputation with this sort of thing from this one. And he’s called in here, in Da Vinci Code, because he was supposed to have a meeting with the man who was murdered in the opening scene, a museum curator who works at the Louvre in Paris, France. That scene had the curator killed by an albino monk named Silas, (Paul Bettany,) while running down the halls of the museum in the middle of the night. And as he lay dying, the curator constructed a message, written with invisible ink, and setup a display where his own body would be sprawled out to look like one of the famous paintings of Leonardo Da Vinci. The he police in Paris were able to go through the appointment book of the curator and see that the man was meant to have dinner with Landon that night. And so they bring Landon in. It’s a man named Captain Fache (Jean Reno,) running the investigation, and he seems to suspect Langdon pretty heavily. There’s a woman named Sophie Neveu (Audrey Tatou,) working on the investigation with the police, and she hands Langdon an earpiece with a pre recorded message that tells him the police are after him. It also helps him escape, first by finding a bug that The police planted on him. And just like that, Langdon and Neveu are on the run. This movie, like Angels and Demons, doesn’t just stick with our two main characters the whole time. Instead it shows us the inner workings of an organization that is responsible for the murder of the curator. This organization features Bishop Aringarosa as the religious leader and a mysterious man calledThe Teacher as the one giving the orders. We don’t get to see the identity of this man, but it is pretty clear that Silas is doing his bidding. The movie has Langdon and Neveu follow clues around Paris. At one point they go to a bank and get through some heavily guarded security checks in order to access a box in a vault. At another, they discover an ancient artifact with a message inside. This is National Treasure type stuff. Only that other movie knew what is was and embraced it. That film was campy fun, in the vein of the Indiana Jones series. The Da Vinci code is much more series. And on top of that, the locations, riddles, and action set pieces aren’t nearly as cool. The mystery element is entertaining, but there isn’t really a hole lot here to differentiate this film from others if it’s kind. Tom Hanks is great in the role, but even he has s better film playing this exact character, in Angels and Demons. And the storyline expects us to buy a lot, regarding some secrets behind the story of Jesus Christ. The film does a nice job of utilizing technology to light up certain letters and images in such a way that it shows us what Langdon is noticing. This is the same kind of Technical trick that director Ron Howard used with Russell Crowe in A Beautiful Mind to show us how John Nash viewed the world. Howard is at it again here, and makes good use of this so that certain letters and symbols pop out from the others in the background. This is especially cool when Langdon takes Sophie to meet a friend of his named Leigh, (Sir Ian Mckellan,) and Leigh uses the image on a flat screen TV to move pieces of a painting around. The Da Vinci code is an enjoyable movie that takes its characters into a mystery – coverup – conspiracy sort of plot, through the streets of Paris. The clues are fun, but the story itself isn’t especially enriching. Maybe it’s just that there have been so many films just like this. Maybe it’s that there aren’t enough characters or plot threads, which is something that was rectified with Angels and Demons. There’s a nice surprise at the end, but other than that, this movie has few memorable moments.